I like to start our packing process at least 2-3 weeks ahead of time. Use the packing list above to help you start. 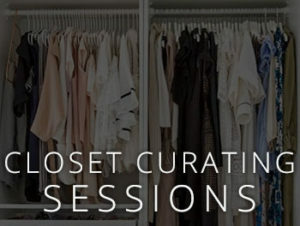 Makes lists of the things you need to pack, assess your families closets and drawers to see what clothing/swim wear/shoes you currently have, and that fit properly. 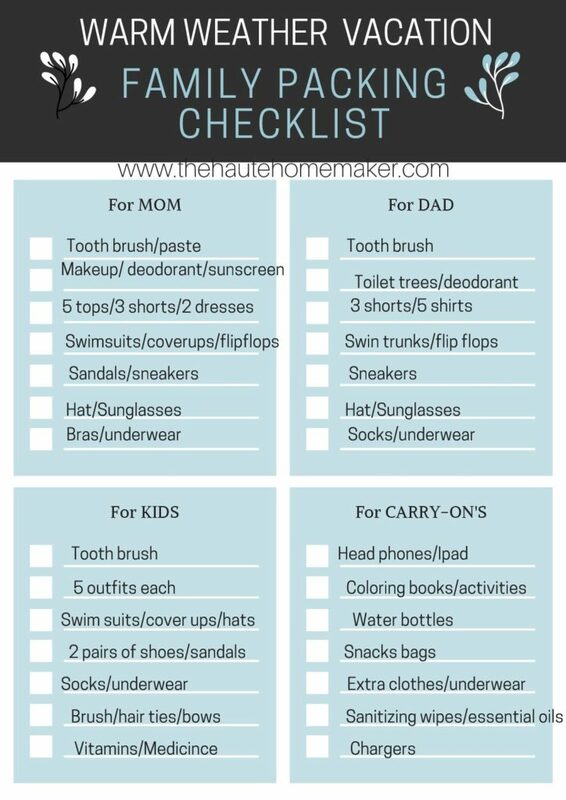 Then make a list of the things you need to buy for your trip, (kids clothes, swim wear, activities for the plane, snacks, suncreen). Doing this ahead of time can help spread out the expenses and ensure your not stressing and scrambling at the last minute! Make sure to check the weather for where you are going so you know exactly what to pack. We always bring some kind of light jacket or sweater/sweatshirt option, in case there is cool weather or rain. 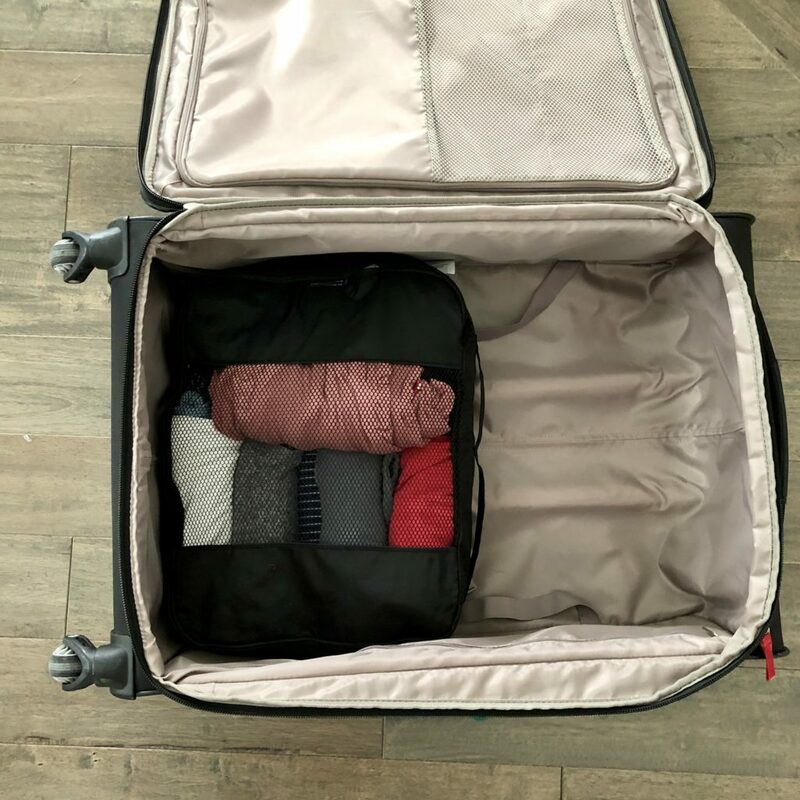 You can use your travel outfits as those warmer layers also, (leggings, joggers, cardigans, hoodies, jackets), then that leaves more space in your suitcase. Make sure you have proper travel documents well ahead of time. Do you each have your drivers license? Do you need a passport for where your going? I always carry a copy of my kids birth certificates in my wallet just in case. Some airlines require proof of a child’s age (especially if they are under 2). Make sure you have your health insurance information with you just in case anyone may need medical care. Print out your boarding passes at home ahead of time, or have scan-able copies on your phone. This will save you time at the airport and is one less things to do or stress about. Weigh your suit cases at home to ensure you do not exceed the weight limit (check your airline). Make sure to pay for your bags if they are extra, ahead of time. It is usually cheaper than paying at the airport ticket counter. If you are traveling with your kids and many bags, or you’re running late, and don’t want to stand in the long line at the ticket counter, consider curb side check-in (if available). There is usually little to no wait, just make sure to tip them after they have taken care of you. Give each child their own small carry-on back pack to hold their snacks, and activities for the trip. My toddlers love having the responsibility of their own bag, and it also helps keep everything more organized. I try and stick to a neutral color palette (white, grey, black, light pink, brown) to make packing easy, picking pieces that can be interchangeable, and can be worn several different ways. Less is more, for a beach/warm weather vacation. You usually don’t need as much as you think! I try to pack 1-2 pairs of comfy sandals (1 pair that can be worn for dinners out), 1 pair of flip flops for the pool/beach, and 1 pair of sneakers for walking/working out (I wear mine on the plane to save room). I like to use cubes for packing our suit cases and roll outfits together to save room, and keeps items more organized throughout the trip. Don’t forget underwear/bras, we have forgotten those items in the past (its easy to do)! My husband is easy to pack for. He is very casual, and likes to keep things simple. So for him, 4-5 shirts, 2-3 pairs of shorts, a pair of sneakers, a pair of sandals, swim trunks, a hat, and sunglasses, is all he needs. Again, keeping things neutral, (white, grey, blue, brown) helps to easily mix and match everything. We usually eat out 1 or 2 times per trip, so basic, and casual outfits can be worn wherever we go on our trip. 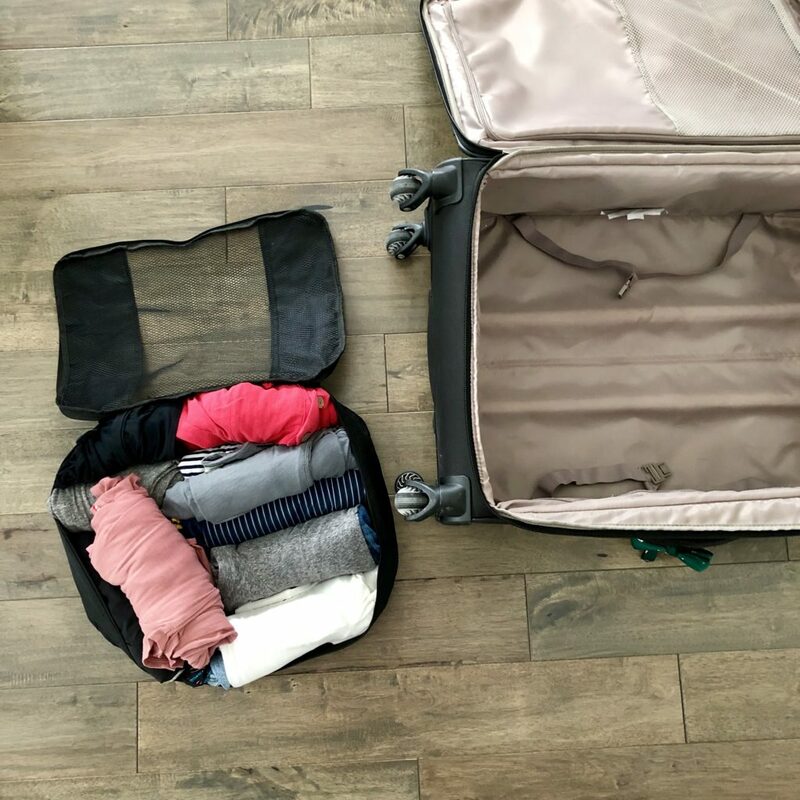 Keep in mind the kinds of things you will be doing on your trip (eating out, lounging by the beach/pool, day trips, eating in, etc), to help you know what pieces to pack. We like to stay in a house/condo that has a washer and dryer, so outfits, and swimsuits can be washed and reworn, simplifying how many outfits each person needs. 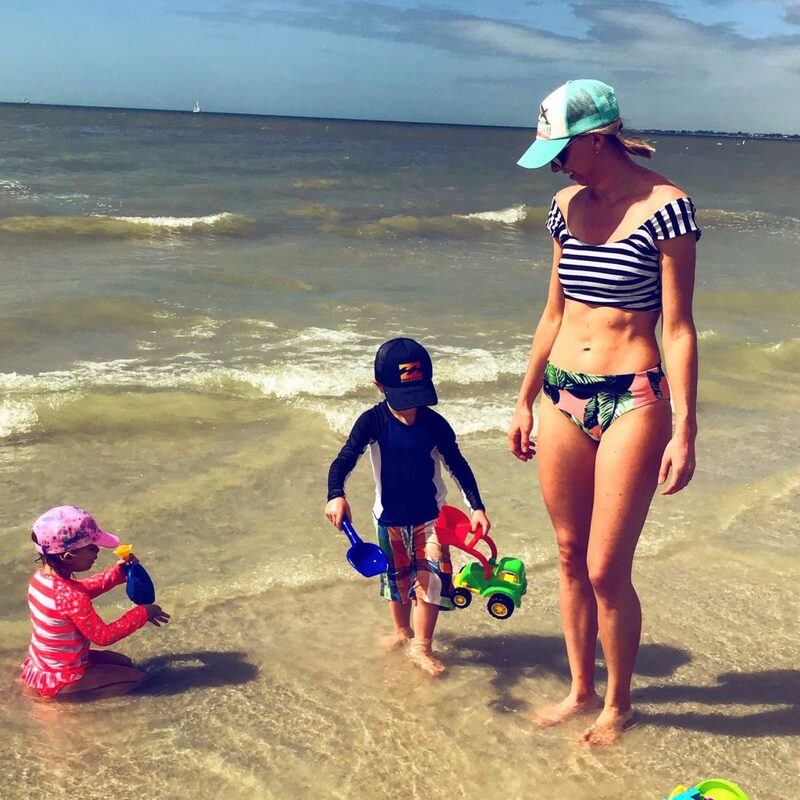 Making sure the kids have good sun protection is key. Rash guards and nice because they offer SPF 50 protection, and help to keep little arms and shoulders from getting sun burned. We are usually at the pool or beach several hours each day, so ensuring they are well protected from the sun makes for a much more enjoyable vacation. Hats, sunglasses, good shoes for getting wet/sandy the beach/pool/ walking around are also a must. I love these or these for both my kiddos. I like pack a few more outfits for the kids, 5-6, since we seem to go through more clothes at their ages (toddler life). But their clothes and shoes take up less room, and I would rather be prepared with a few extras if needed for them. I always keep an extra outfit for each in our pool bag, just in case we have an accident, or decide to go somewhere right from the pool/beach. I love using these packing cubes to keep everyone’s stuff organized in our suitcases. They also save a lot of space! Each person gets a 1-2 cubes to store their clothing, shoes, underwear/socks, toilet trees. Rolling all of your clothing helps to save space, and to keep outfits together. This also takes the guess work out of what to wear, when you arrive. Every outfit is already put together, ready to throw on and go. 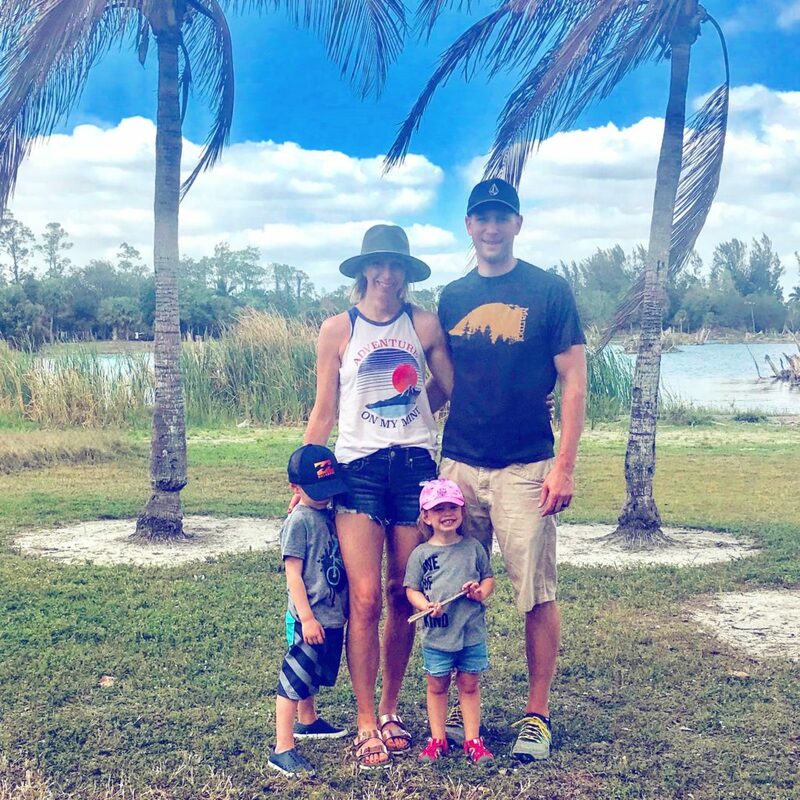 I hope these packing tips are helpful as you prepare for your upcoming family vacation. 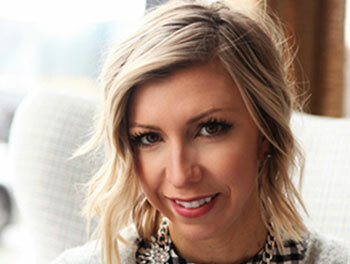 Stay tuned for my next blog post as I share a warm weather travel must-have’s capsule. The best and most versitle pieces to pack for your vacation.